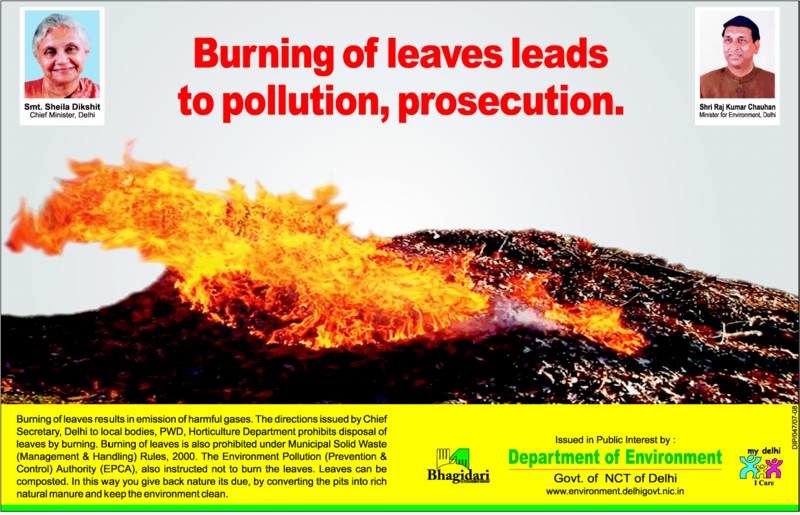 As per the following advertisement published in Public interest by the Department of Environment (Delhi Government), the Chief Secretary of Delhi has issued directions to local bodies, PWD and Horticulture Department against the disposal of fallen leaves by burning. Previously on DelhiGreens: Leaf litter – we are no less! The Municipal Solid Waste (Management & Handling) Rules, 2000 and the Environment Pollution (Prevention & Control) Authority (EPCA) also prohibits the burning of leaves. Composting of leaves and giving back to nature its due, by converting the pits into rich natural manure has been suggested by the Department of Environment. PrevFinally, Delhi Administration Talks of E-waste! in spite of continuous complaint dry leaves are still burnt in Vasant Kunj,road next to Sector a pocket a park. !! it is hazardous! as kids are playing in the park & the smell & smoke spreads all over the area .. including residential buildings.